U.S. veterans who were exposed to depleted uranium during the 1991 Gulf War have continued to excrete the potentially harmful chemical in their urine for years after their exposure, according to a new study published in the journal Health Physics. The study indicates that soldiers may absorb depleted uranium particles through inhalation, ingestion, or wound contamination, said Roberto Gwiazda, an environmental toxicologist at UCSC and lead author of the study. Fine particles of depleted uranium are created when munitions made with the material strike a target. The new study did not address the health effects of exposure to depleted uranium, a subject of ongoing debate, but focused on a technique for detecting past exposure. Low concentrations of uranium in the urine are normal due to ingestion of naturally occuring uranium in food and water. 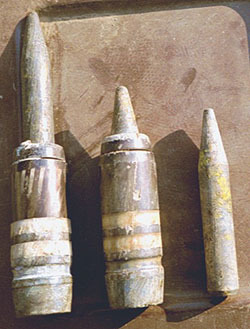 Depleted uranium is a by-product of the enrichment process used to make nuclear fuel, in which one isotope of uranium (235U) is extracted, leaving behind material depleted in that isotope. Depleted uranium is still weakly radioactive and, like other heavy metals, can be toxic in high doses. Because of its high density and other properties, it has been used in armor-piercing ammunition and in armor for fighting vehicles. Gwiazda and Donald Smith, professor of environmental toxicology, developed a sensitive analytical technique to detect depleted uranium in urine samples. By measuring the relative abundances of different isotopes of uranium in the urine samples, the researchers were able to distinguish between natural and depleted uranium. "This is the only unambiguous way to determine past exposure and uptake of depleted uranium," Gwiazda said. The analysis of samples from Gulf War veterans was performed in collaboration with the Baltimore Veterans Affairs Depleted Uranium Follow-up Program, which is assessing, treating, and monitoring veterans who may have been exposed to depleted uranium during the war. The researchers applied their technique to three different groups of Gulf War veterans. The first group of soldiers had shrapnel in their bodies as a result of "friendly fire" incidents in which their tanks or armored vehicles were hit by munitions containing depleted uranium. The second group consisted of soldiers who did not have shrapnel in them but were involved in the friendly fire incidents to different degrees, either because they were in the vehicles that were hit or because they participated in recovery operations. The third group was a reference group and consisted of soldiers who participated in the war but not in combat operations. As expected, the soldiers with embedded shrapnel had high concentrations of uranium in their urine, and the isotope analysis showed that it was depleted uranium, presumably being released into their bodies from the shrapnel. A more striking finding was the presence of depleted uranium in the urine of a significant number of soldiers in the second group, without embedded shrapnel but with potential exposure through inhalation, ingestion, or wound contamination. The uranium concentrations detected in this group were, on average, six times higher than in the reference group, but were still within the normal range for the U.S. population. Nevertheless, Gwiazda said, it was remarkable that the signature of depleted uranium could still be detected so many years after the exposure. "These samples were taken six to eight years later," he said. The Veterans Affairs (VA) monitoring program has not reported any findings of clinically significant health effects related to exposure to depleted uranium, even in the highly exposed soldiers with embedded shrapnel. Any health effects of exposure to depleted uranium may not be detectable without studying a large number of exposed individuals. The technique developed at UCSC could be used to screen a large number of people to identify those with past exposure to depleted uranium. In addition to possible health effects in soldiers exposed during combat, concerns about depleted uranium include environmental contamination of battlefield sites. Civilian populations may be exposed through contact with depleted uranium fragments and dust left in the soil or with contaminated military equipment left behind after a conflict. "We don't know if that kind of exposure will have any health effects. But now we have a technique that enables us to detect past exposure to depleted uranium," Gwiazda said. The paper was published in the January issue of Health Physics. The authors include Katherine Squibb and Melissa McDiarmid of the University of Maryland School of Medicine, in addition to Gwiazda and Smith.